Mass spectrometry (MS) is an essential tool in a broad variety of fields, with good efficiency up to the kDa mass range (~10-21 g). We demonstrate here Nano-electro-mechanical systems mass spectroscopy (NEMS-MS) with arrays of individually addressed nanomechanical resonators, allowing for measurements in the MDa (~10−18 g) to GDa (~10−15 g) mass range. Monocrystalline silicon resonators were fabricated from SOI wafers with very large scale integration processes. The resonators are electrostatically actuated and use a differential piezoresistive readout. Particles landing on a resonator add to its total mass and cause its resonance frequency to downshift. As these frequency shifts also depend on the landing position on the resonator’s surface, the frequencies of two resonance modes are monitored simultaneously to resolve the mass and position of the deposited particle. The device testing was made by comparing real-time measurements of the size distribution of Ta clusters made by gas-phase condensation, using simultaneously NEMS-MS and Time of Flight Mass Spectroscopy, on a setup installed at INAC/Spintec. The NEMS-MS provides an accurate spectrum of the cluster populations over a large mass range (530–2400 kDa).One of the main challenges to perform practical NEMS-MS analysis stems from the size mismatch between the analyzed beam and the small nanomechanical detector area. To overcome this limitation arrays of 20 individually addressed nanomechanical resonators were designed, with each resonators designed with a distinct resonance frequency that allows them to be individually addressed. Using such arrays, mass spectra of nanoparticles have been recorded with excellent speed due to a significantly enhanced capture cross-section compared to individual resonators. 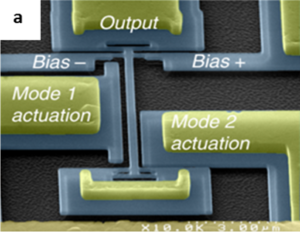 This study is a part of a multidisciplinary project including i) the development of a setup coupling NEMS to a Surface Acoustic Wave Nebulization system, which will enable the analysis of large biomolecules and macromolecular systems that are too big to be reliably measured by conventional mass spectrometry, and ii) the development of new devices using nanoresonators with optical transduction, in order to improve the readout efficiency for very large and dense arrays.